So it was the end-of-term party at my son’s playgroup and us parents were supposed to make snacks for the children’s potluck. And I remember going through his planner and making a note of it, and wondering whether to make cookies or sandwiches or something else. And then I just plum forgot till the night before the party and I knew I wouldn’t have time to pump out 2 dozen cookies in the morning. But thankfully, because I had been browsing Malou’s beautiful travel and food blog, I found just the thing to make- caramel popcorn! It’s fun, it’s easy to make and you can dress it up or down! Plus, I had the best caramel sauce recipe to dress it with. I looked at more variations online and decided to add almonds to mine and put them in little paper cups for individual servings. Those of course, went to school; the leftovers I just put in a mug. This is great for a kids party where you are low on time or do not have too many ingredients on hand. Grease a large bowl lightly with olive oil. (This is to prevent the caramel from sticking in clumps when you start mixing it in with the popcorn. Now make the caramel. Melt the sugar in a heavy-bottomed saucepan. Just place the sugar on the heat and swirl it around so it doesn’t stick to the bottom. It will start turning an amber colour. Keep twirling every once in a while till it has melted completely. Add your butter. PLEASE BE CAREFUL. Wear a long sleeved tee and use a kitchen towel because there will be bubbling and spluttering and TRUST ME molten sugar on your skin IS NOT NICE. Once the sugar and butter have incorporated well, pull the saucepan off the heat and add in the cream and here too I URGE YOU TO BE CAREFUL as there will be more foaming and bubbling. 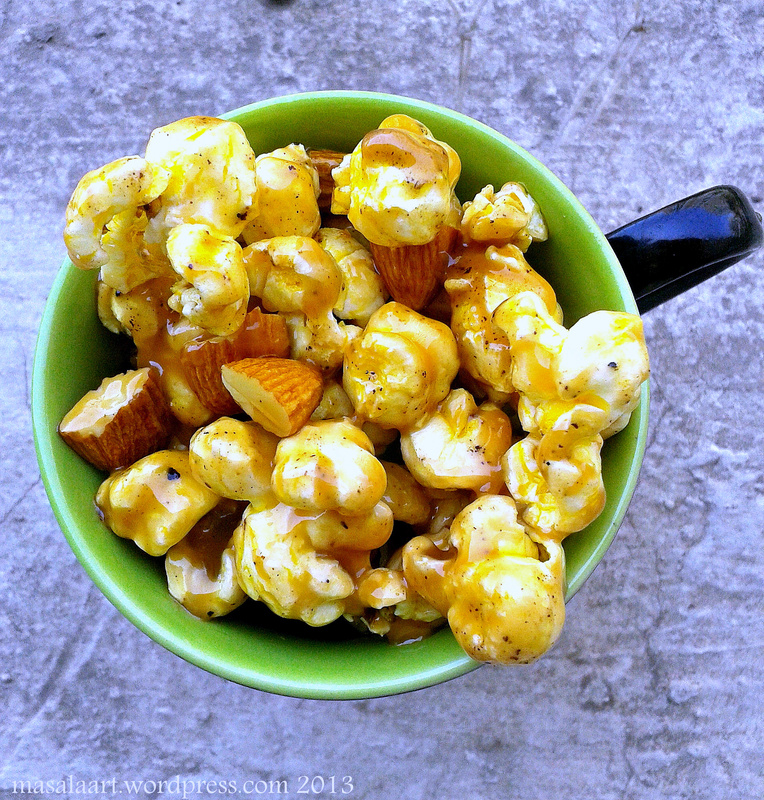 Once everything is combined, allow the caramel sauce to cool a little and then pour it over your popcorn and mix well so that everything is evenly coated. Super Snack!!! I love me some caramel popcorn!! It’s the best. For movies, for parties, at the mall, at a baseball game, all by yourself…pretty much anywhere! What a fun and tasty snack! Perfect for ball games! Thanks! I could eat this all day. Seriously.